Dan Parks, President and Creative Director at Corporate Planners Unlimited (and Founder of Virtualis) is quoted extensively in this article regarding the demand for virtual events (and Virtualis), their cost efficiency and uses of Virtualis by other clients of his. As interesting as the technology is (and it sure is cool), I found the virtual event planning (by Virtualis and Trend Micro) to be most interesting. 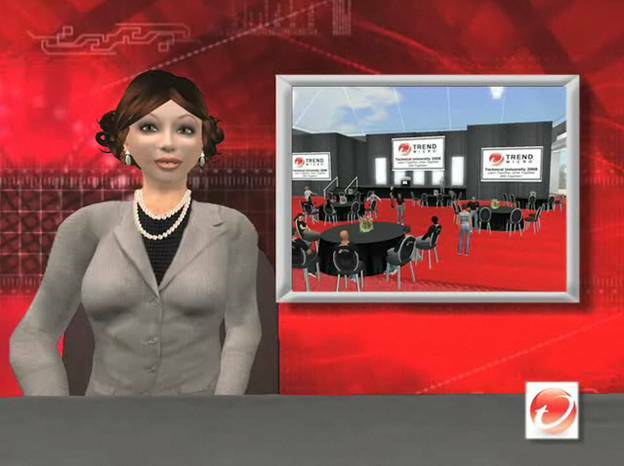 In the Virtual Worlds News article, you can view a 2 minute video overview of the event (given by a Second Life avatar / news reporter, no less). Alternatively, the same video is available on this page: http://silverandgoldie.com/trendmicro.htm (Machinima by Silver & Goldie, who [presumably] produced this nifty segment). The in-world sessions were spread across two tracks – product sessions and educational sessions. The product sessions provided product updates on emerging technologies, along with case studies on the latest web threats. The educations sessions included creativity sessions, which were held in futuristic settings (where avatars sat around in Jetson-like furniture). For fun, the event included four unique technical challenges. 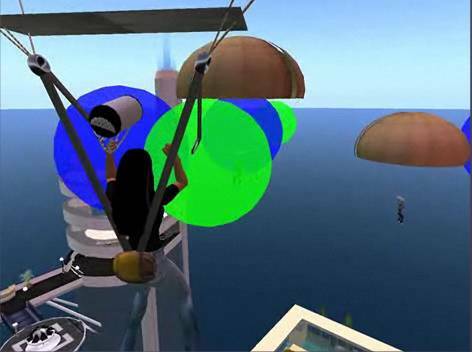 In a parachute challenge, avatars descended from the sky in parachutes and had to score points by grabbing balls that flew by. A treasure hunt challenged participants to find specified items throughout the island – scores were tabulated and the top 2 teams squared off in a Trend Micro Tech Challenge – a live game show that was played in front of the entire audience. 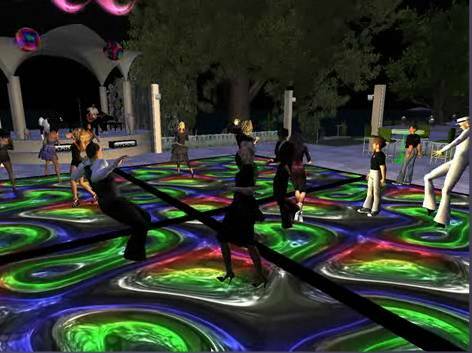 At the end of the first day, a night club hosted dancing, along with music from “one of Second Life’s most popular entertainers”. All in all, quite a show. I admire the attention to detail paid by Virtualis and Trend Micro in planning the events – this was truly a melding of virtual world benefits with the full trappings of an all-day physical (corporate) outing. The typical applications of virtual worlds and virtual tradeshows – lead generation, marketing, exhibiting products and services, internal training – has now taken on a new angle. We’re now seeing internal training, complete with virtual team building! This entry was posted on Thursday, February 5th, 2009 at 9:47 PM and is filed under Virtual Worlds. You can follow any responses to this entry through the RSS 2.0 feed. You can leave a response, or trackback from your own site.